Bartholomew House, 63a Bartholomew Street, James Gilbert's butchers shop, is now two shops, the Vinh Kee Chinese takeaway (yellow sign) and the dog groomers to the left. Guy Leslie Harold Gilbert was born in Newbury in 1895 the son of James Gilbert and his wife Ada née Coles. 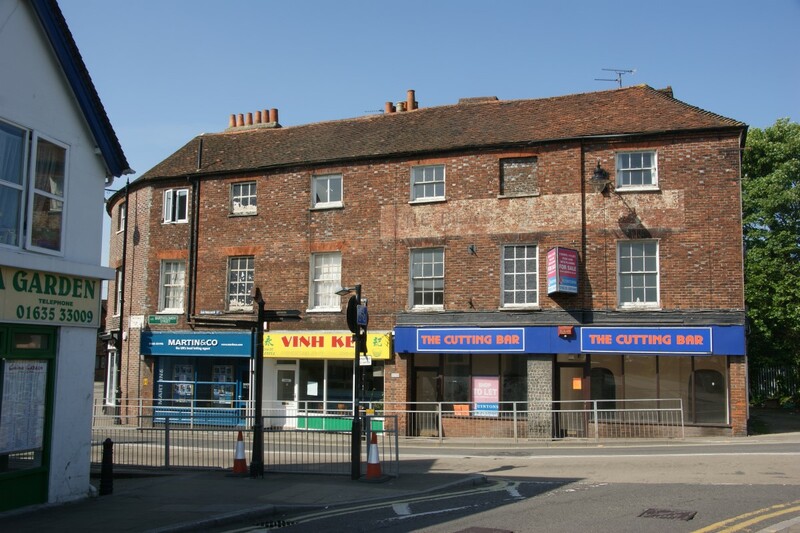 His father was a butcher whose shop over time was located in four different premises in Bartholomew Street. The first shop was at 119 Bartholomew Street (demolished to widen Market Street), then 59 (currently Delta Polish Food), then 63a (between the Black Boys Hôtel and Kimber’s grocery store) and finally, after the war, at 104 (Old Thai House). 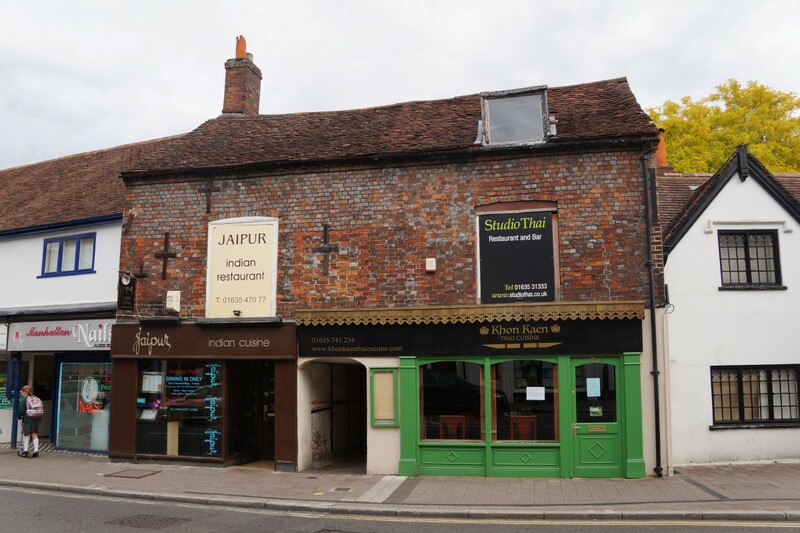 The family lived over the shop in 1901 and 1911, but the elder children were born while they were living in Greenham - much of which was within the Borough of Newbury. Young Guy became teenage Harold in the census returns for 1901 and 1911; indeed his military records (the few that remain) list him as L H Gilbert, suggesting he dropped the Guy completely. Henceforth he will be referred to as Harold, apparently his preference, despite a possible confusion with his eldest brother Harry. Harry Newell Gilbert was the eldest of James and Ada’s sons, but it is unclear who was their eldest child because Harry had a twin sister, Daisy Ella; they were born in 1891. Stanley William (born 1894) and Violet Winifred (1900) complete the family as listed in 1911. However, the census also includes information about the number of deceased children, in this case three. Child mortality was high in those days. Five Gilbert children under the age of one are recorded as dying in the Newbury registration district during the period Ada was bearing children. Although it is not possible to determine which the children of James and Ada were, it is very likely that they were the following Gilbert babies buried in Greenham churchyard: Bernard Gilbert (buried on 8 June 1893, aged 8 months), Lionel James (15 Sep 1897, aged 8 months), and Margaret Primrose (14 Apr 1898, aged 5 months). The last two were recorded as being from Bartholomew Street, Bernard from Greenham. Harold left school and started work as a draper’s assistant; a few years later war broke out. In May 1915 Harold went for a holiday in London with his brother Stanley, from where they returned as soldiers. Both had signed up, but for different regiments; Stanley opted for the Army Ordnance Corps and Harold the Hampshire Regiment. Stanley had been working as a clerk for the local lighting engineers; perhaps he had moved to a more technical rôle in his work and this was seen as matching one of the specialist requirements of the Ordnance Corps? After the war James Gilbert moved his shop to 104 Bartholomew Street (right). Harold spent some months in training, first at Winchester, then at Southsea before going overseas in October 1915 to Egypt as a replacement for the 2nd Battalion serving on the Gallipoli peninsula. However, by the time Harold reached Egypt on 1 December the Gallipoli campaign was running down; the last of the attempts to break out of the allied beachheads was in August and the debate between the politicians and the army command was all about evacuation. Perhaps because of this uncertainty, perhaps because of his relative lack of training, Harold was not sent to join the battalion at the front; instead the battalion came to him, leaving from the Helles beaches on the last night of the evacuation (8/9 January 1916) and arrived at Alexandria on 14 January before moving on to Suez. On 30 January it was reinforced with a draft of 16 officers and 378 other ranks (100 being men returning from hospital after recovering from wounds or sickness) – it is probable that Harold was among this draft. After a short period in Egypt the battalion left for France, arriving at Marseilles on 20 March. By 13 April it was at the front, in Divisional Reserve at Mailly-Maillet; 10 days later they relieved the 4th Battalion Worcestershire Regiment in the front line at Beaumont. 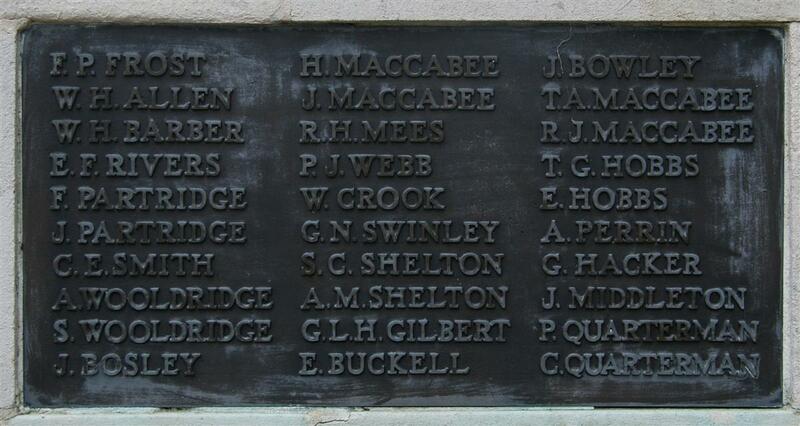 On 1 July as the Battle of the Somme opened the 2nd Hampshires were in reserve. The battalion moved forward to support an attack by the 4th Worcesters, to be launched at 12.30pm; however, this was cancelled as the scale of the disastrous result of the opening assault became apparent and it became impossible to move fresh troops to the firing line through communications trenches packed with the dead and wounded. On 29 July the battalion was moved away from the Somme front, north to the Ypres Salient. The battalion orders were to consolidate the firing line position near Potijze, improving the defences without encouraging any reaction from the enemy. It seems that the latter element of the orders was not carried out successfully. 8th On the night of the 8/9th the gas alarm was sounded by the horn on our left. The wind was from the NE and very light and as soon as the gas cloud was observed to be approaching our line the alarm was taken up and due precautions made. The cloud took about one hour to pass and came in two waves. During this time our supporting artillery opened up a barrage of shrapnel fire and the enemy made no attempt to leave the trenches. The enemy at the same time opened up a fairly heavy shrapnel fire on to our front line system and main communications. A few large howitzers shells being directed at our reserves. The gas seemed to be a particularly deadly kind and penetrated a considerable distance the effect being felt some distance in rear. It was noticeable that the gas corroded all metal that it came in contact with and killed many rats and birds. 9th Early on the 9th it was found necessary to reinforce the firing line by 3 platoons of Z Coy and 2 Lewis Guns in order to replace casualties caused by the gas. Casualties: Capt P B S Hall, 2Lieut E W C Twiner, 2Lt H C Scoggin & 2Lt J Prelurdy Killed 2Lt G A Miller, 2 Lt A W H Foster, 2Lt M J Smith, 2Lt L H Churcher 2Lt M C Tollemache & 2Lt K J Graham Wounded. Other Ranks 125 Killed (and died of wounds), 100 wounded. Harold was one of the casualties that night, but not one of the dead. He was evacuated from the line as far as the large hospital complex at Lijssenthoek. There he died the following day. GILBERT – Aug 10, in hospital, from gas poisoning, Pte Guy Leslie Harold Gilbert, 2nd Hants Regt, youngest son of James and Ada Gilbert, of Bartholomew-house, Newbury, aged 20. Mr and Mrs Gilbert, of Bartholomew-house, Newbury; received on Saturday last the painful news of the death of their youngest son, Pte Guy Leslie Harold, of the Hants Regt, which took place on August 10th in hospital, as the result of gas poisoning, at the age of 20. A letter from the Chaplain stated that he was practically unconscious when brought to the hospital, and the doctors could see there was little hope for him. Before long he passed away to the rest he had so bravely earned. His body is laid in the Cemetery, where a cross will mark his grave. The Chaplain adds: “I know what a sad blow it will be to you, but even in your sorrow you will be proud of your dear boy, who gave himself with such willing and loyal devotion to his country. He is now in the loving care of God, and I pray the same God may be your comfort until you meet again in Paradise. Your boy’s life is not wasted; it is spent in a worthy cause.” The official letter announcing the death is accompanied with an expression of sympathy from the King and Queen, to which the signature of D Lloyd-George is appended. The deceased enlisted in May 1915, in the 2nd Hants Regt. He and his brother went to London together on holiday, and both returned as soldiers. After five months training at Winchester and Southsea, he left England in October for Egypt, where he spent four months, and in the early part of the year he was drafted to France. Since leaving the shores of the home country, he had not once returned on leave. Both his other brothers are on active service. Stanley William, aged 22, who enlisted at the same time as his deceased brother, was sent out to France in March of the present year. He is in the Army Ordnance Corps. The oldest brother, Harry Neville [sic], aged 25, is in the Army Service Corps. He originally joined the Worcestershire Yeomanry when encamped in Newbury in the Autumn of 1914. He is still in England, but is daily expecting to leave for the Front. Harold was buried in grave VIII. D. 14A at the massive Lijssenthoek Military Cemetery. Locally Harold is remembered on tablet 2 of the Newbury Town War Memorial, the roll of honour and memorial board in St Nicolas Church, Newbury and on the kerbstone surrounding his mother’s grave in Newtown Road Cemetery. Harry Newell Gilbert signed up with the Worcestershire Yeomanry on 11 November 1914, around the time they left Newbury for winter quarters in Norfolk. At some stage he transferred to the Army Service Corps, possibly a result of a lack of fitness. It was with the latter that he went to France as Driver T4/242567 Gilbert. On 16 March 1919 he was discharged, not as a result of being demobilised but due to ill health; entitling him to a Silver War Badge – though the purpose of the badge (to show all that the chap in civvies was not a shirker, but one who had done his bit) had all but disappeared by 1919. Whatever ailed him may have been a permanent problem; he died in Birmingham in 1939 aged only 47. Stanley William Gilbert served with the Royal Ordnance Corps achieving the rank of Corporal (08240). He survived the war and died in Newbury in 1969 aged 74.